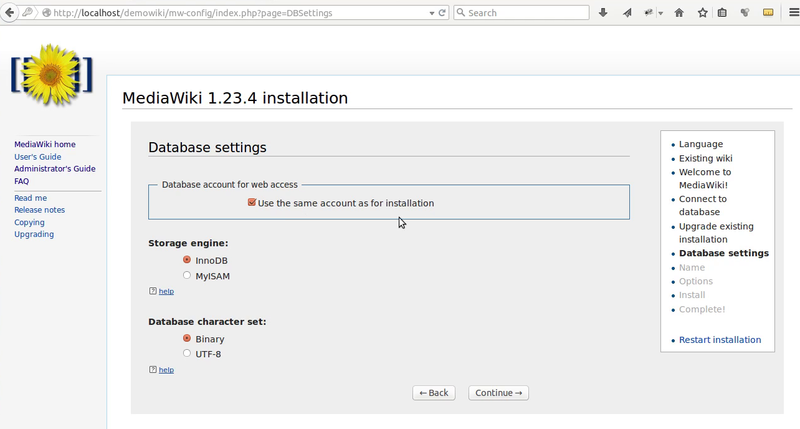 In this tutorial we are going to demonstrate how to install Mediawiki on the Xampp/Lampp server. We have already listed the software or tools used for the work. 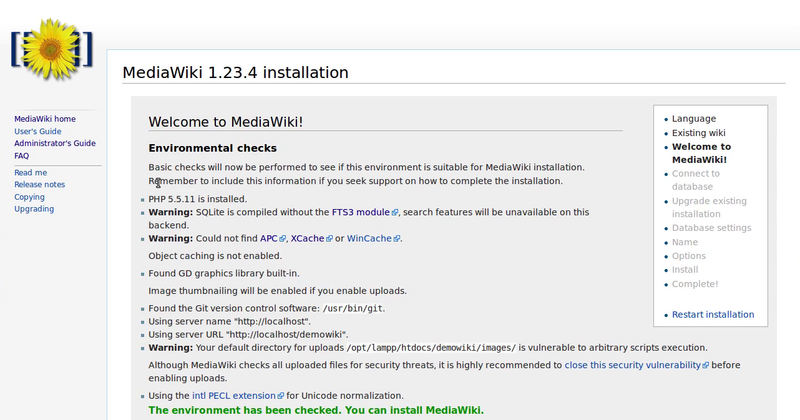 But before we go for the Installation let us introduce you with Mediawiki. Mediawiki is the wiki software, you probably don't know much about the Mediawiki but you must have used Wikipedia at least once in your life. Yes the Wikipedia is also a Mediawiki application. The Mediawiki was foundation of Wikipedia, later on it was released as open source software so that any one can use it for creating their own wiki and today, Web is full of wikis. Wiki is a web application which allows to create an online information repository. It is based on pages structure. You can create as many pages as you like. you can search through them you can link them internally or externally. You can upload and embed images and other media in there. Full introduction of wiki or mediawiki is out of scope of this article. you can search the Wikipedia itself for more information. 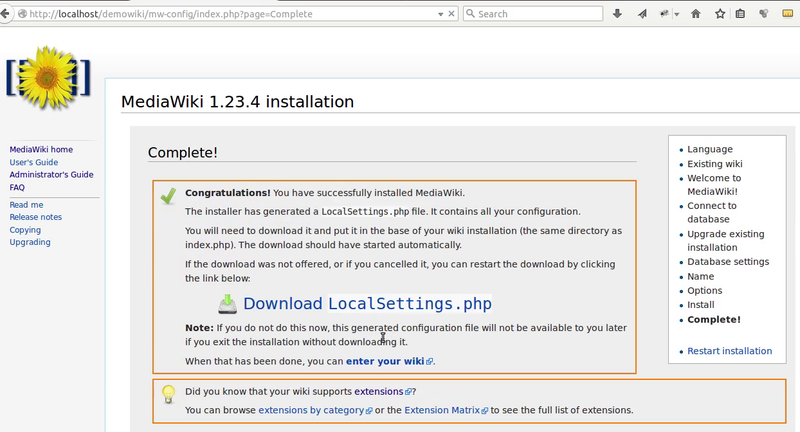 Following are the steps you need to follow to successfully Install the Mediawiki on your server. Please pay attention that we are working with the Xampp/Lampp server, it could be on Linux or Windows, if you want it to be on IIS, the steps remains the same but only the server setup will be different. Download the mediawiki archive from Mediawiki.org. We are using Mediawiki-1.23.4 as demonstration, but you shall choose the latest stable version(LTS would be even better option). Go to root directory or any directory in your web root where you want to install your instance and extract the files. In our case we have created a directory named "demowiki". Open the browser and enter the path where you want to access you wiki. 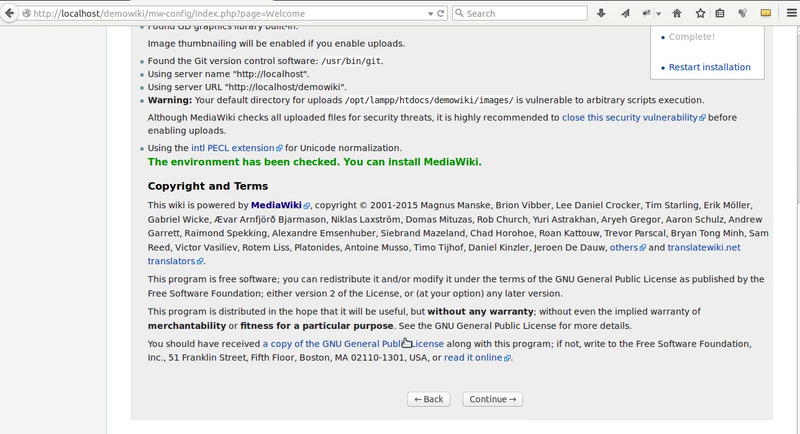 The mediawiki system will prompt you with the welcome message for mediawiki Installation. Click set up the wiki link to proceed. 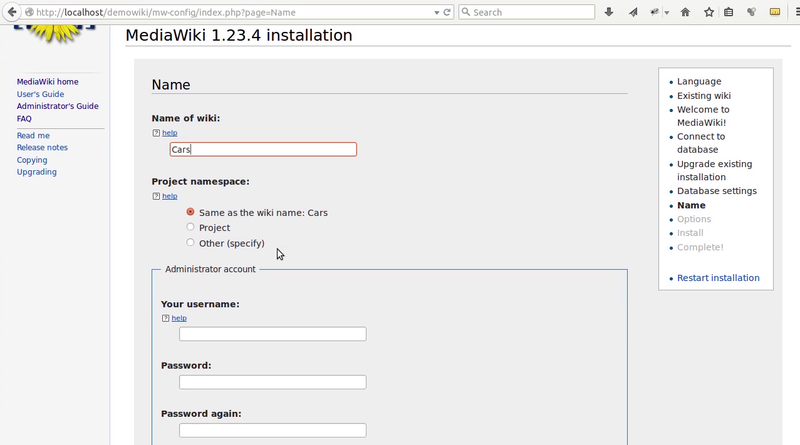 In next step choose your Installation process language and Language for the wiki. "Your Language" is the language in which you want to proceed. "Wiki Language" is the language in which you want your wiki content to be in once the installation is complete. In simpler terms, the public language for your wiki. Press Continue to proceed to next step. Now Mediawiki scans for its requirements and present the result to you, if there is some problem please check for it and fix it mostly there is nothing typical, only if some php or apache module is missing, you can always fix it form your php.ini or httpd.conf file. 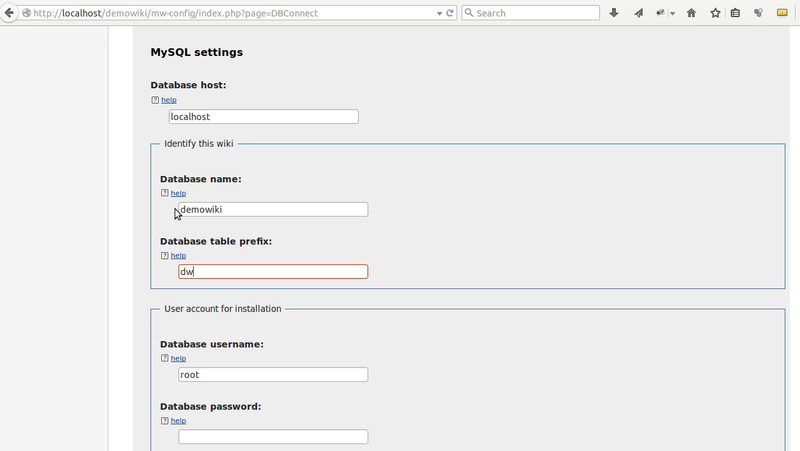 Next it asks for your Database needs, you can choose from available options(we are going with MySQL though). And fill in the details. Assuming you have created a database for this installation if not, no worries, you can do it now, or even better Mediawiki installation will create one for you, just make sure the username and password you provide has privilege for the same. Next, Choose advance database settings, keep in mind that binary is always better option if your wiki is going to support language having special characters(characters that don't come under UTF-8 specification). Finally fill in the Administrative information and it will not bother you much. Just don't forget to pick the appropriate radio button at the bottom. Next it'll ask you to confirm installation. Click continue to confirm. Once the installation is complete it will show you status of all modules. 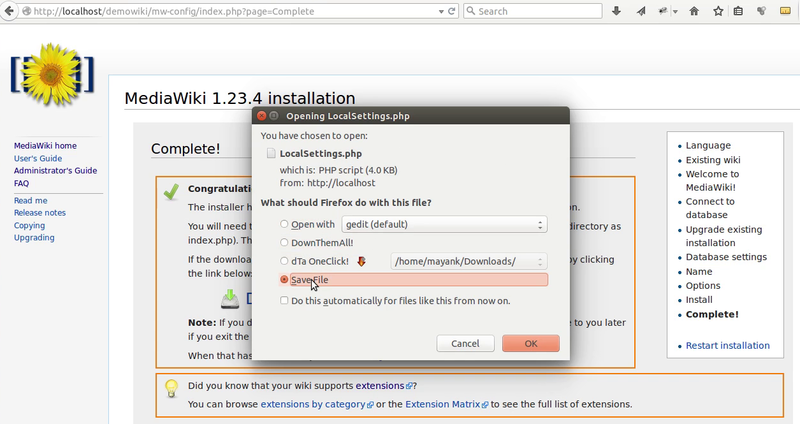 At last you will be presented with LocalSettings.php file download. Save it and move to the root of your wiki installation. This file holds all the global settings of your wiki installation like name of your wiki, database details, you can install or remove extensions from this file. We will be talking more about extensions in coming articles. Here you are ready now you would be able to access your wiki. 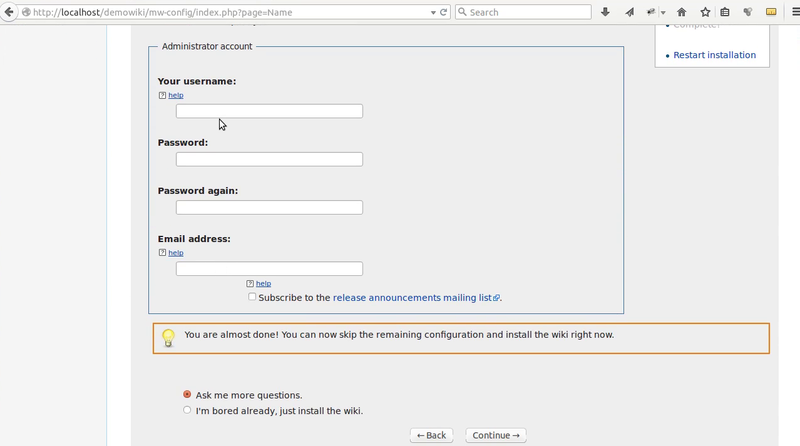 Log in using the Administrator credentials you entered during installation and you are all set to work out wiki. 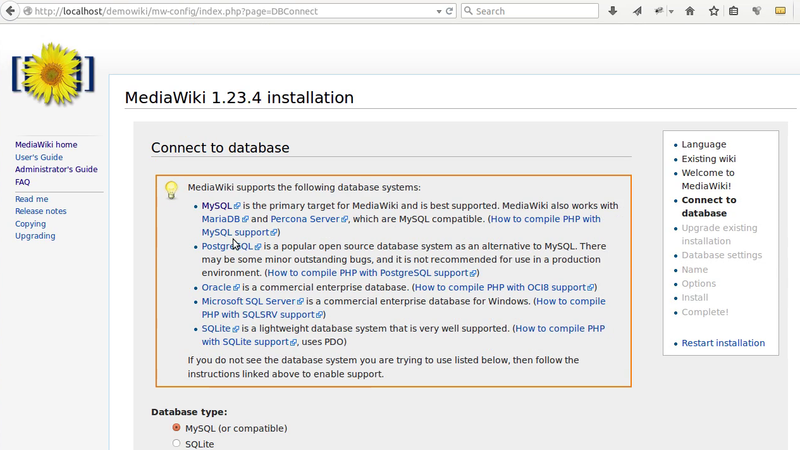 If you want to explore details of Mediawiki visit official Mediawiki. If you want to learn some good mediawiki tricks point to point explore our other articles on mediawiki. To know about various details about installation watch the video below.